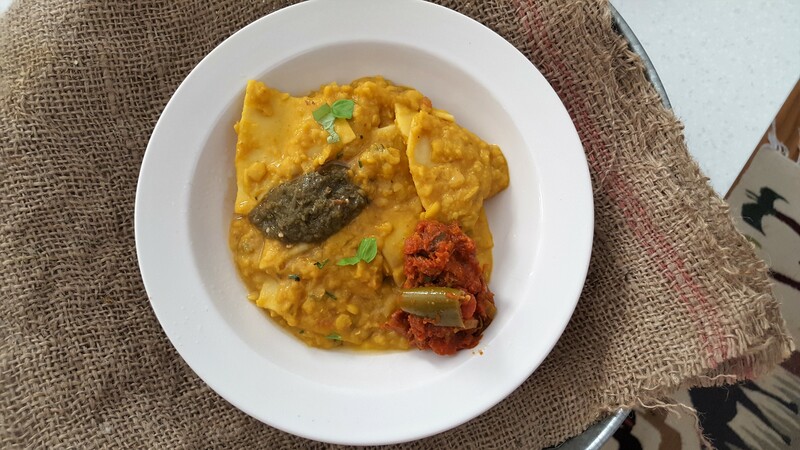 This is a very simple and easy dish to make; a super delicious home cooked food that mum used to make for the whole family. Simple staple ingredients used to make a perfect one pot wholesome meal. Such dish is very nostalgic as it reminds me so much of my childhood, in a happy surrounding amongst an extended family. Memories are there to treasure and there are certain things that one cannot wipe away from the heart, time will pass but memories will remain. My grandmother, my “mame bofemme” as we used to called grandma, would be looking after us the little munchkins while mum would be busy cooking on the open wood fire. In Mauritius as many will know most people have two kitchen the indoor (show kitchen) and the outside “la cuisine dibois” as we used to call it. Only because that’s where cooking will be done on open wood fire. 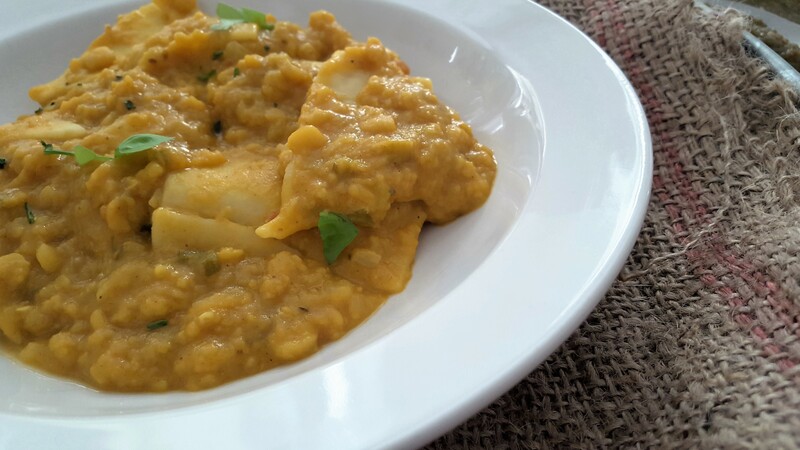 Dhal “Pitta” is a dish of dhal with pieces of flour dough (pasta), very simple and yet very tasty. As this is a dish that involves flour dough, just like making pharata, whenever mum made such things, she would give us the kids a piece of dough each to play around to keep us out of mischief. Who need play dough when you can get away with real flour dough…..that’s real playful time. 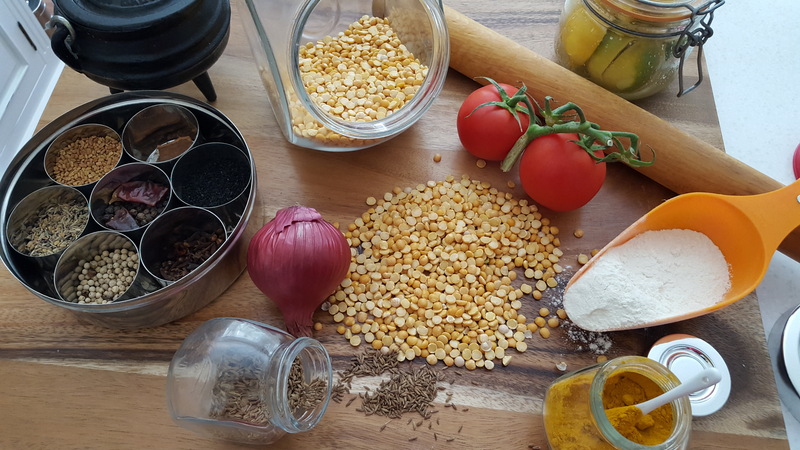 Dhal Pitta a concussion of spices and great flavours that I like to enjoy with a hot chutney or rougaille. Dishes like these I find is always a hit and very comforting. As I say it is always the simplest and easiest food that taste so good, and yet full of all good things. For me a powerhouse of energy boost that I enjoy very much. 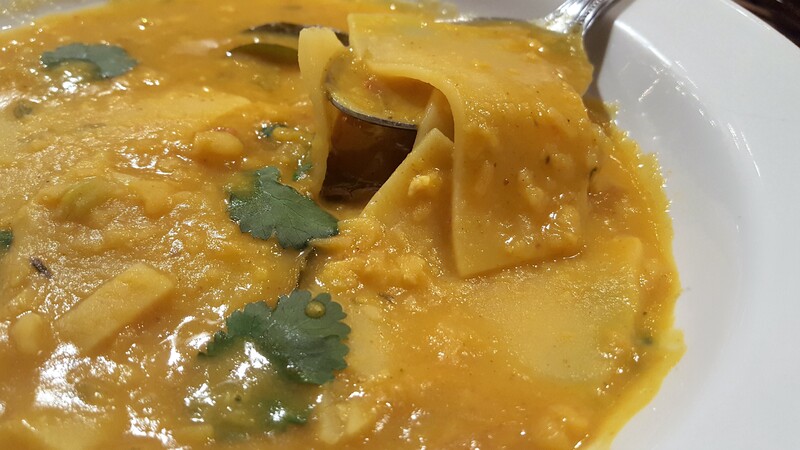 Hope you will try and make it and please send me your verdict…..
Wash the dhal and lentils in cold water. 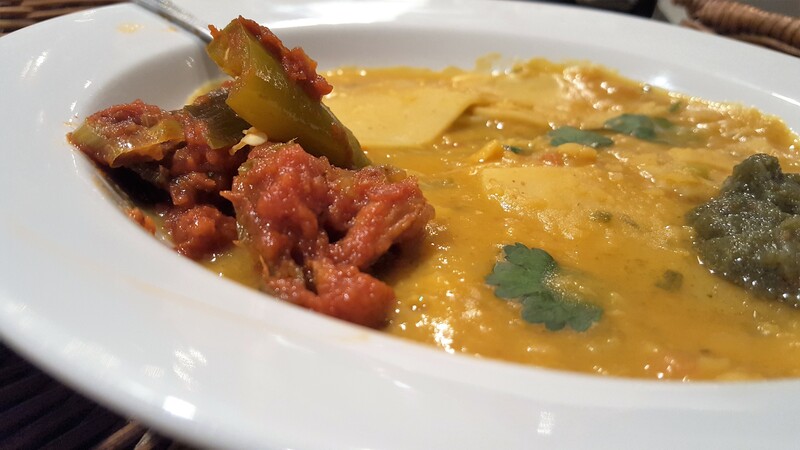 Place the washed dhal/lentils in a deep saucepan, add water, cloves, and bay leaves, salt and bring to the boil, then simmer for around 15-20 minutes, until the dhal/lentils start to break down and become soft. 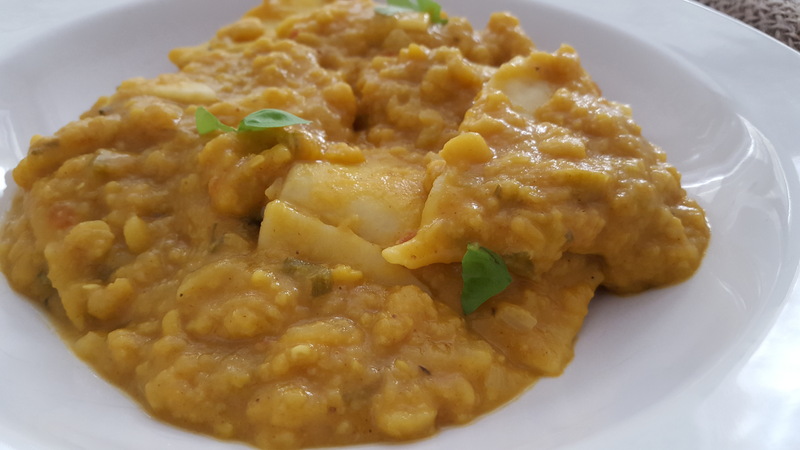 (You will need to keep an eye when boiling dhal stirring occasionally and removing the white foam like scum that comes up as the dhal comes to a boil). Meanwhile, heat the vegetable oil in a saucepan start to prepare the spice mixture. Add the sliced onions, cumin seeds, curry leaves, turmeric, chopped tomatoes, ginger and garlic. To this mixture add the partly boiled dhal/lentil and stir well. Leave to cook until all the spices have merged into the spices, taste for seasoning. Add the chopped coriander stalk to the mixture – I find this add so much taste to the dish. 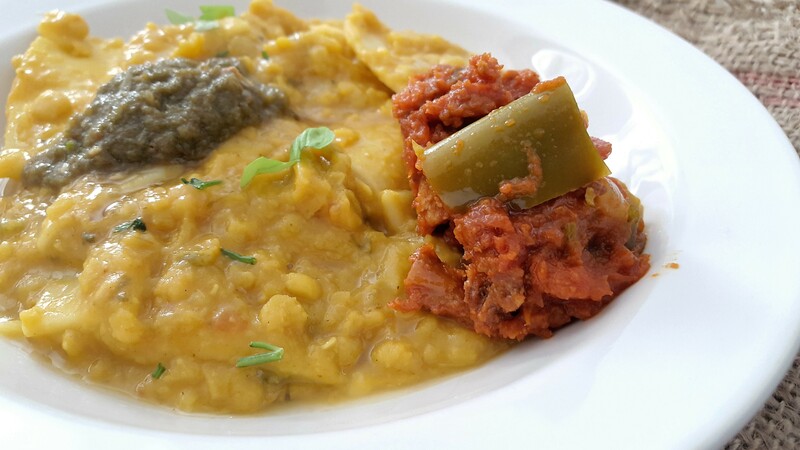 Add the dried fenugreek leaves (if using), allow to simmer until the dhal is well cooked. Meanwhile start preparing the “pitta” dough. For this all you need is a small bowl, add the flour followed by the salt and mix with enough water to have a soft dough. Leave to rest for a few minutes. When ready to roll, divide the dough into small balls. On floured surface roll just like you making chapatti, cut into little squares or any shape of your choice. 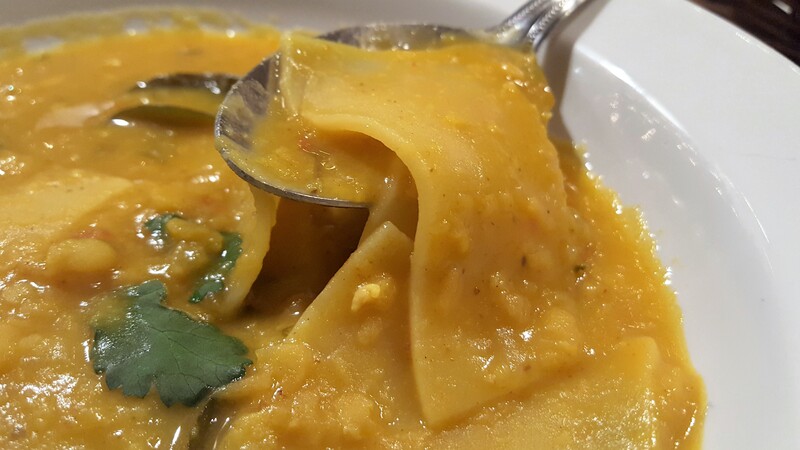 When the dhal is cooked add the dough pieces to the cooked dhal, stirring gently as you do that so they don’t stick together. Leave to cook until the dough is cooked. Stir in the chopped coriander, sprinkle with the garam masala followed by the ghee sprinkled on to. 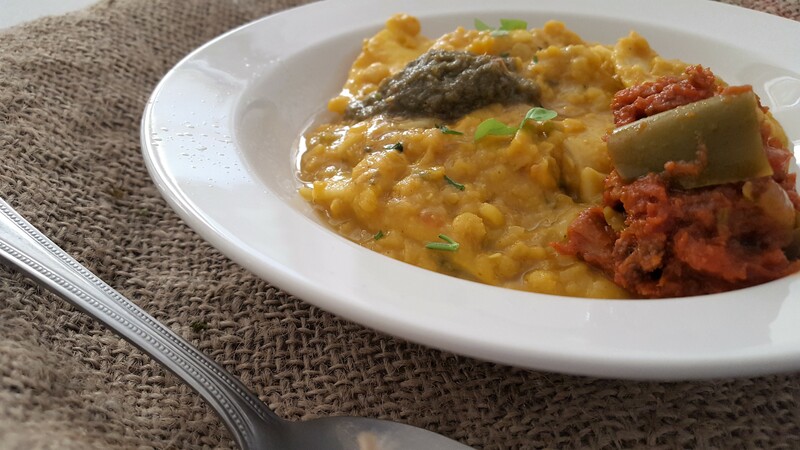 Serve the Dhal Pita warm with a coriander chutney or a spicy “rougaille” …In my case what you see is a “rougaille snoek” – salted fish “rougaille”. Brinda’s Note: You can always add some tempering spices and fried onion on the top to serve.